If your older child is struggling to ride a bike, riding a balance bike can be very beneficial and cut down the time of learning how to ride a pedal bike considerably. 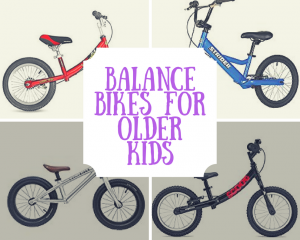 There are balance bikes for older children and even adults so it’s something you can definitely buy and there are a few options at the end of the article. The problem is that balance bikes for older children can be very expensive and older children often don't need very long on these balance bikes to achieve the balance they need to move onto a pedal bike. So it’s a personal choice as to whether you want to make an investment in a balance bike at this age. If you are on a budget and would prefer not to have to fork out for a balance bike there are other options. My eldest son never had a balance bike and at age 6 he could not ride a bike. So we took the pedals of his bike and he used it as a balance bike for a few days, He didn't ride for long on these days but it was enough for him to learn the balance needed for a pedal bike. We then put the pedals back on his bike and he practically just went straight ahead and pedalled away. This worked really well for our eldest son. The problem with doing this is that pedal bikes tend to be a lot heavier than balance bikes. Therefore, it’s difficult for children to get up a lots of speed on these bikes to be able to glide. To get round this with my son, there is a small downward slope near my Mum’s house. My son used this to get up enough speed to be able to glide on his bike and learn to balance. Obviously you don't want them going superfast down a huge hill so be careful (they can get up super speeds and crashing on a downward hill can result in huge injuries or even worse!) but a very slight downward incline can be helpful. It also goes without saying don’t forget helmets and safety gear. Sometimes all it takes is a few hours on a balance bike to help children learn the necessary balance which they can take onto a use with a pedal bike. One option is to borrow a balance bike from a younger friend or relative for a couple of days. For this to work you will need to make sure that the seat can adjust to a height that they are able to ride the bike on. You also want to make sure that the are not over the weight capacity for the bike. After getting to experience how to balance they can then go onto try again on a pedal bike. ✔️ Important - when choosing a balance bike your child will need to use his or her feet to push along the ground. Therefore it's important that your child's feet should be able to sit flat on the floor when riding a balance bike. Before purchasing measure your child's inseam. Their seat height of the bike should be set about 1 inch less than the child's inseam to enable them to get on and off easily. If you would prefer to buy a balance bike for your older child, here are some great options. If you’re child is over 115 cm (approx 45 inches) then consider a bike with 16 inch wheels. The strider balance bike featured is designed for kids from 6 to 12 years. It is very lightweight at just 8kg. It has air filled tyres so it’s got great traction for off road, dirt tracks and other cross terrain.​It’s seat can adjust from49.5 cm to 65 cm so will grow with your child. It has an easy quick release seat post to adjust the seat when you need to. It also comes with a hand brake.The bike features frame mounted front and rear brakes for great stopping power. The Strider is one of the only balance bikes with 16 inch wheels so is probably the best choice for older and taller children. ✔️ Tyres - older children are heavier and need more cushioning and traction. Therefore a balance bike for an older child should have pneumatic tyres. EVA foam tyres are fine for younger children but air tyres are a must for children aged 6 plus. They also offer more traction and are better for uneven surfaces and terrain. The Ridgeback Scoot Balance bike is aimed at kids between 4 and 8 years old. It has 14 inch wheels and comes with 2 seat posts of 40cm and 55cm so you should be able to adjust the seat to the perfect height for each child. The tyres are inflatable and puncture resistant and offer a smooth ride both on and off road. It comes in 6 different colours so there should be one suitable for both boys and girls. The long handlebar on the scoot gives the rider good control. It also features a durable 6061 aluminium alloy. The Scoot is built to last. It weighs 5.6kg so is lighter than the Strider. ✔️ Hand brake - some balance bikes for younger children don't have hand brakes as they tend to stop the balance bike with their feet and there hand / eye co-ordination often isn't good enough to use a hand brake yet. As children get older, faster and heavier a hand brake is very important. 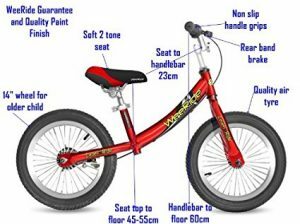 Another option of a 14 inch balance bike is the weeride. It states it's aimed at kids aged 3 to 5 but it's seat height goes quite high so it's an option for a 6 year old as well. Just measure a child's inseam before purchasing to make sure. The seat height should be 1 inch less than the inseam to enable them to get on and off the bike. Ideally you would want the maximum height seat to be a couple of inches more than the child's current inseam if you hope to get some growing room out of the bike. ​The seat adjusts from 45cm to 55cm. It also features rear hand brake. It's easy to assemble, takes about 1 minute. The Early Kid's silver bike is an option for a small 6 year old (being designed for kids aged 3 to 6). By age 7 it is likely to be too small for most children. It might be a good option if you have a younger sibling to pass it onto. The seat adjusts from 38 cm to 47.5cm, so the max seat height is quite low compared to other bikes on this page. Measure the child's inseam before you make the purchase to ensure the maximum seat height will be heigh enough. The bike features drop handle bars, giving the bike a very "grown up" look and feel. However, there's no handbrake which really should be on a balance bike for a 6 year old. Tyres - although you will see EVA foam tyres on balance bikes for younger children, a balance bike for older kids will always have pneumatic (air filled tyres) as you will there is a greater need for cushioning. Air tyres with knobbly treads offer the best traction especially on uneven terrain. They offer a smooth ride on all surfaces while maintaining traction in the dirt. ​ Tyres which allow to kids to run down dirt tracks can be super fun especially as they get older. Make sure a helmet is worn. Brakes - ideally a hand break is a must as kids get heavier, older and faster. Many balance bikes have a single rear hand brake, others have dual brakes (front and rear brakes) for greater stopping power. Dual handbrakes aren’t a must-have on a balance bike but are good for older users and add an extra element of safety. It also allow kids to begin working on braking skills. All ages and abilities - a balance bike is a fantastic option for all ages and abilities. They are fun and there are even options available for adults. They are also a good option to give confidence and build bike riding skills in older kids who may additional challenges such as low muscle tone and poor balance which makes it much more difficult to learn how to ride a bike. ​Many kids with additional needs such as dyspraxia, autism and downs syndrome have also had great success with riding a balance bike. Riding a bike can be hard with lots of different tasks to be able to manage at once. A balance bike breaks down the skills needed, so to start off it's as easy as walking with a bike. The skills can be built one by one so before you know it kids are flying! Confidence - a balance bike will help kids build up the confidence needed for riding a pedal bike at speed. They can learn balance while being in control at all times. Reduces the need for stabilisers - older kids may feel more conscious riding with stabilisers on a training bike. A balance bike will enable them to develop the balance needed to ride a pedal bike without the need for stabilisers. As long as they can pedal many kids will find they can come off a balance bike and use a pedal bike straight away. It's fun - learning to ride a bike can be very stressful especially if kids take a while to get it. A balance bike will enable them to learn how to balance and have fun at the same time.